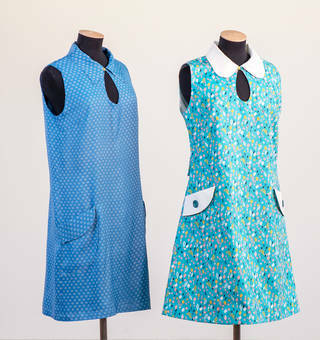 Want to make your own 1960s-style minidress? Our free, downloadable sewing pattern is inspired by Mary Quant's classic A-line mini – the look that defined a generation. This easy-to-use sewing pattern has been designed exclusively for us by Alice & Co Patterns. The design includes two neckline options, two pocket options, three collar finishes, and two sleeve finishes – all inspired by Mary Quant's iconic designs. It's a classic A-line mini which sits just above the knee – you can shorten it if you want to show a bit more thigh, or lengthen to turn it into a more 70s style maxi-dress. You'll want to try this out more than once in lots of different fabrics and combinations! The pattern is provided in two size ranges (UK 6 – 14 and 16 – 22), and in three page formats (A0/A4/US Letter). Download your chosen size and print it off in full colour. The A4/US Letter formats can be printed at home using a standard printer, or you can print the A0 files at your local copy shop or with an online service. Mary Quant is one of the most iconic designers of the 1960s. Her fun, young, innovative approach shook up British fashion, with eye-popping designs like hot-pants, playsuits and the era-defining mini-skirts and dresses – all in rainbow colours. Left to right: Dress with hood, 1967, Mary Quant Archive. 'Footer' jersey dress, Mary Quant, 1967, Mary Quant Archive. 'Eclair' dress, Mary Quant’s Ginger Group, 1969, UK. Museum no. T.90–2018. © Victoria and Albert Museum, London. Minidress with 'Peter Pan' collar, Mary Quant's Ginger Group, 1967, England. Museum no. T.61–2018. © Victoria and Albert Museum, London. 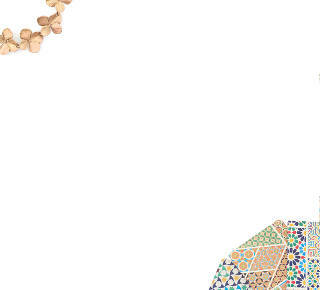 Quant was a self-taught designer and pattern cutter. Her first designs were adapted from commercially available sewing patterns, which she customised to make her own. Later, Quant produced a range of home sewing patterns so that women across the world could create their own versions of her famous designs. 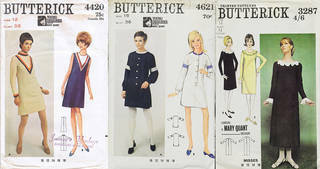 Selection of Butterick paper sewing patterns, young designer: Mary Quant. © Victoria and Albert Museum, London. Don't forget to share your photos: #WeWantQuant! 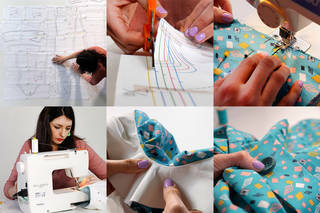 A huge thank you to all of our pattern testers: Aileene, Alice, Anna, Cassandra, Christina, Cynthia, Dhurata, Di, Elaine, Eleanor, Fern, Jane, Joy, Judith, Liv, Louise, Marjorie, Mary, Megan, Morven, Nandita, Sara, Stacie, Tifaine, Victoria, Wai. Try more fun, easy-to-use sewing patterns by Alice & Co Patterns. Fabric generously provided by Ray Stitch.